Photograph courtesy Richard Howatt 25196 was north of the border on April 10th 1985 working the relief 12.05 Bristol Temple Meads - Edinburgh forward from Carstairs with 25175. The twenty year ten month career of D7546/25196 saw allocations to only London Midland Region depots. Dual brake equipped (fitted in 1974?). Time between last Classified repair and withdrawal: 72 months. Time between withdrawal and scrapping: 16 months. October 1968 to Preston Division (D10). September 1974 to Kingmoor (KM). 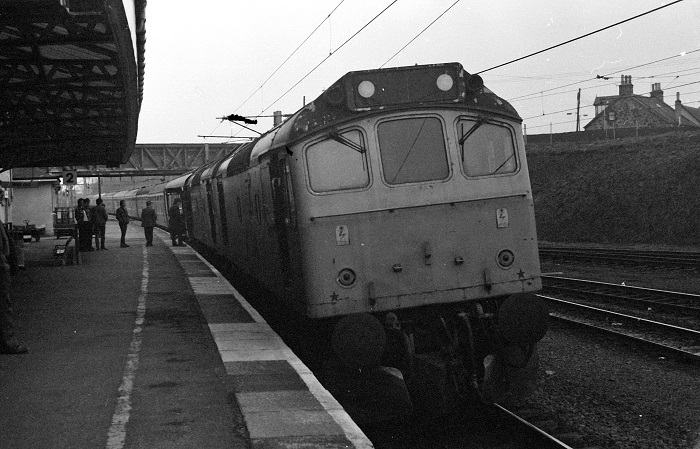 January 1975 to Kingmoor (KD). 25196 was the 276th Class 25 to be withdrawn, one of six retired during March 1986. After withdrawal 25196 was stored at Crewe depot until March 1987 when it moved to Gresty Lane until June 1987, then Basford Hall until July 15th 1987 when it moved (see details below) to Leicester Humberstone Road and into Vic Berry's yard on July 20th 1987. By the first week of August 1987 25196 had been scrapped. 25089, 25196, 25230, 25324 Crewe – Vic Berry Leicester, July 15th 1987. 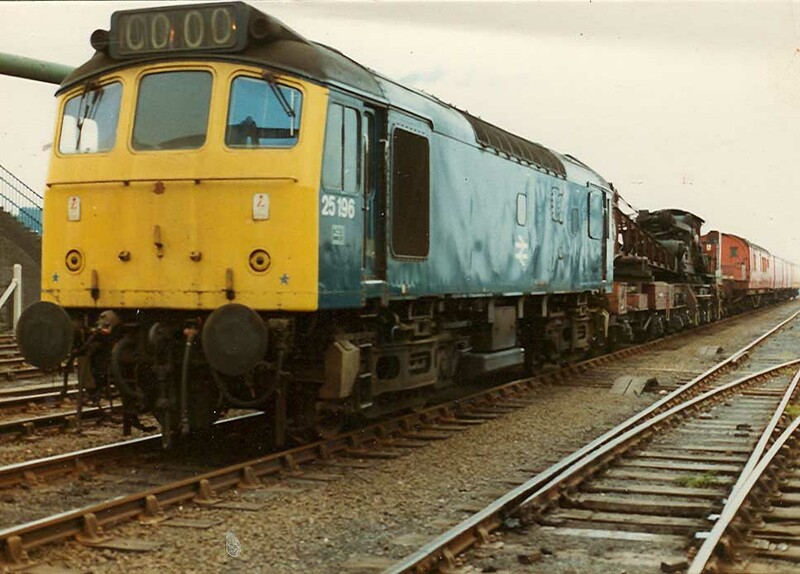 Photograph courtesy Ian Hammond Withdrawn 25196 has already begun to surrender parts to keep the ever dwindling fleet of Class 25s operational, seen here at Crewe Depot on May 11th 1986. Noted Derby Works November - December 1979 (General repair). An early passenger working for D7546 took place on August 13th with D5282 working the 08.36 Nottingham - Llandudno Town and the return to Nottingham. On October 19th a Euston - Barrow return Motorshow special was worked forward from Lancaster by 25196 & 25234. On August 15th the 17.00 Derby - Matlock and 17.50 return were worked by 25196. 25196 was being used on a local Tyne Yard freight turn on February 25th. The 09.00 Llandudno Town - York on August 21st was worked by 25196. On September 9th 25196 worked the 17.45 Cardiff - Bristol Temple Meads. No passenger workings have so far been recorded for 1977. On May 29th 25196 & 25184 worked the 09.29 Manchester Victoria - Llandudno Town and the 17.20 Llandudno Town - Manchester Victoria. On August 1st the 11.30 Bangor - Manchester Victoria was worked by 25196. On September 1st 25196 was noted passing Guide Bridge with loaded ICI hoppers. Photograph courtesy Ian Marsh Derwent Ironworks, Workington; 25196 has arrived with a brakedown crane to rerail the errant 37006 and allow business to get back to normal (date not known, but prior to October 1979). Due to a continuing shortage of electric power the 01.50 Stafford - Liverpool was hauled by 25196 on June 22nd. 25179 entered Derby Works during November for a Classified repair. This including replacing the No.2 end cab roof, after release from the Works this cab roof started to lose its paint prematurely, thus becoming a notable spotting feature for this locomotive. 25196 was noted southbound at Warrington Bank Quay with a freight on November 13th and was also noted this day at Warrington Bank Quay assisting a Chester bound two car diesel multiple unit. 25196 was noted passing Grange over Sands with a tanker train on May 26th. On June 24th the 12.27 Crewe - Cardiff and the 17.10 Cardiff - Crewe were worked by 25196. On September 23rd 25196 & 25213 worked the 20.55 Kensington Olympia - Stirling motorail to Willesden. The 18.18 Birmingham New Street - Euston on September 29th failed behind 85001 at Bletchley, 25196 dragged everything to Euston. 25196 was noted passing Bescot with a vacuum braked freight service on March 26th. 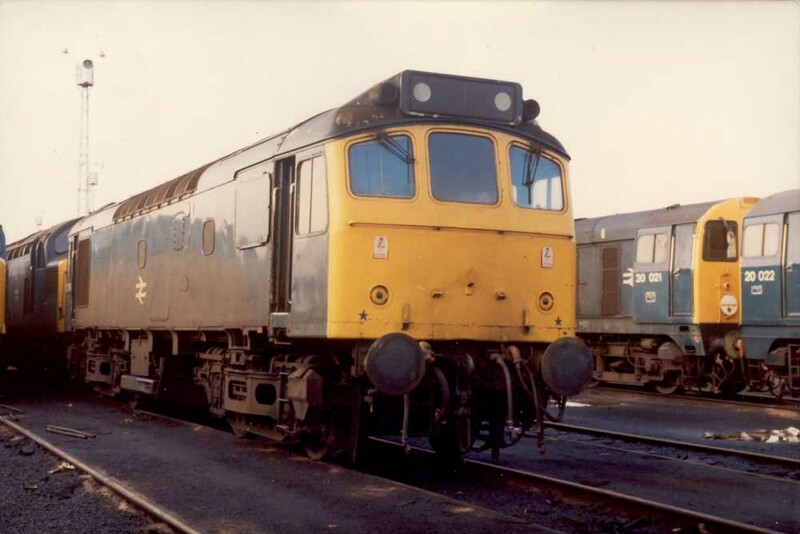 On May 7th 25196 was noted southbound at Micheldever with a lengthy train of vans, possibly a Toton - Eastleigh freight, the Class 25 was equipped with three-piece miniature snowploughs.The next day (8th) 25196 worked the 14.14 Norwich - Birmingham New Street. A month later on June 8th 25196 worked the same service, but taking over at Peterborough. On February 20th the 09.40 Euston - Wolverhampton failed at Tring behind behind 86318, 25196 & 25211 dragged the service to Bletchley where 47537 tookover. 25196 was receiving attention at Reddish on April 1st. Another rescue job took place on May 2nd when the 19.30 Crewe - Cardiff failed at Shrewsbury behind 33064, 25196 worked the train through to Cardiff. The 'Manchester Railway Re-union' charter on June 18th was worked from Manchester Victoria to Hellifield by 25196 & 25198. On June 25th the 10.10 Euston - Shrewsbury was worked forward from Birmingham New Street by 25196 & 25208. A very short rescue job took place on July 1st when the 07.50 Manchester Victoria - Glasgow Central failed at Oxheyes behind 87008, 25196 & 25076 dragged the service back to Preston. The 15.10 Manchester Piccadilly - Bristol Temple Meads parcels (eight bogie parcel vehicles) was noted at Cwmbran behind 25196 on July 27th. On August 1st the 08.01 Crewe - Cardiff and 11.40 Cardiff - Crewe were worked by 25196. The Cambrian line was visited on August 6th with 25196 & 25235 working the 07.35 Euston - Aberystwyth forward from Wolverhampton, returning with the 14.00 Aberystwyth - Shrewsbury, at Machynlleth 25235 was removed. On August 12th 25196 was noted northbound at Preston with a short parcels train. 25196 was noted northbound at Trent Junction with 56089 & 56112 in tow on September 9th. On October 27th 25196 was noted northbound at Winwick with a parcels train. 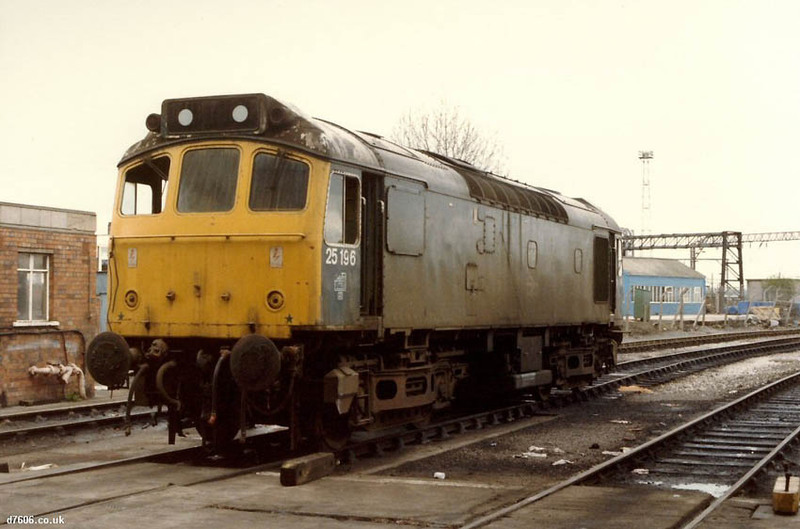 Photograph courtesy Jerry Glover 25196 at Tinsley depot on November 20th 1983. 25196 was noted at Workington with a Sellafield nuclear flask train on April 19th. The afternoon Fords Halewood – Dagenham car train and the return Barking - Fords Halewood, a booked Class 47 turn occasionally featured Class 25s, so noted on May 17th was 25196. On June 11th a short engineers train, comprised of a crane and brakevan were noted at Preston hauled by 25196. 25234 & 25196 were noted northbound through Crewe station with empty bogie oil tanks for Stanlow on July 3rd. On August 29th 25196 was noted northbound at Toton with a lengthy freight. On September 14th the 07.45 Manchester Victoria - Bangor was worked by 25196. Almost two months later on November 9th 25196 worked the 17.32 Bangor - York from Chester to Manchester Victoria after the Class 45 failed. On November 18th 25196 was noted at Aintree with a track panel train. On January 23rd 25196 worked an Ashburys - Bescot mixed freight, being noted at Timperley with four freight wagons, a passenger coach and brakevan. 25196 was stabled at Thornaby on January 27th. 25196 was stabled at Saltley on a snowy February 12th. 25196 was stabled at Toton on February 23rd. On March 21st the Severn Tunnel Junction - Mossend was worked by 25196 & 25200. 25196 was north of the border on April 10th working the relief 12.05 Bristol Temple Meads - Edinburgh forward from Carstairs with 25175. On May 7th track defects in the Birmingham area saw the 10.24 Penzance - Liverpool dragged from Bescot to Walsall by 25196, 47129 took over here with 87024 still attached. 25196 was noted at Leicester depot on May 18th. 25196 was noted at Gloucester on August 12th. The 21.42 Preston - Liverpool on September 3rd was worked by 25196, this being the Liverpool portion off the 18.15 Glasgow - Manchester. 25196 was north of the border on September 21st working the 17.40 Carlisle - Glasgow Central, three days later (24th) it worked the 06.05 Carlisle - Glasgow Central forward from Dumfries after the Class 27 failed. On September 26th 25196 powered the Albion – Waterston tanks, pairs of Class 37s or a single 47 being the norm. On October 10th 25196 was back in the Preston area and worked the 21.42 Preston - Liverpool again, on November 19th 25196 worked the 18.15 Glasgow Central - Manchester Victoria forward from Preston. 25196 & 25192 were noted southbound (?) at Hereford with oil (?) tanks on the evening of December 6th. 1986 was the last year in service for 25196, three passenger workings were handled, mostly involving diesel multiple unit failures. The first occurred on January 30th when the 02.10 Manchester Piccadilly - Grimsby Town was worked to Sheffield by 25196. On February 19th the 17.10 Manchester Victoria - Millom was worked forward from Preston by 25196. Finally the next day (20th) 25196 worked the 06.16 Barrow - Preston. 25196 was withdrawn on March 17th 1986. No.1 cab front by handrail under center window, large piece of paint missing. No.2 cab roof losing most of its paint since at least May 1981 until withdrawn. Three piece miniature snow ploughs (yellow) fitted (no ploughs March 1978 - September 1978); December 1978; November 1980 - May 1982; (no ploughs August 1983 - November 1984); January 1985 - May 1985. Page added August 31st 2013.